This study is the first large prospective RCT of sentinel node biopsy (SNB) compared with standard axillary treatment (level I-III axillary lymph node dissection or four node sampling), which includes comprehensive and repeated quality of life (QOL) assessments over 18 months. Patients (n=829) completed the Functional Assessment of Cancer Therapy – Breast (FACT-B+4) and the Spielberger State/Trait Anxiety Inventory (STAI) at baseline (pre-surgery) and at 1, 3, 6, 12, and 18 months post-surgery. There were significant differences between treatment groups favouring the SNB group throughout the 18 months assessment. 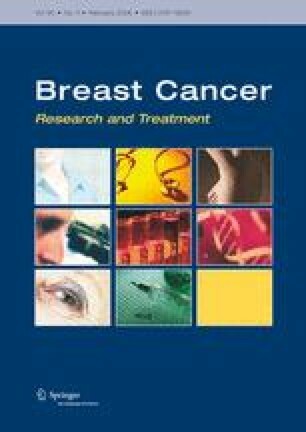 Patients in the standard treatment group showed a greater decline in Trial Outcome Index (TOI) scores (physical well-being, functional well-being and breast cancer concerns subscales in FACT-B+4) and recovered more slowly than patients in the SNB group (p<0.01). The change in total FACT-B+4 scores (measuring global QOL) closely resembled the TOI results. 18 months post-surgery approximately twice as many patients in the standard group compared with the SNB group reported substantial arm swelling (14% versus 7%) (p=0.002) or numbness (19% versus 8.7%) (p<0.001). Despite the uncertainty about undergoing a relatively new procedure and the possible need for further surgery, there was no evidence of increased anxiety amongst patients randomised to SNB (p>0.05). For 6 months post-surgery younger patients reported less favourable QOL scores (p<0.001) and greater levels of anxiety (p<0.01). In view of the benefits regarding arm functioning and quality of life, the data from this randomised study support the use of SNB in patients with clinically node negative breast cancer. We thank all patients in the ALMANAC study, research fellows, other study investigators and all the surgery, nuclear medicine, radiological, radiographic, and nursing staff at each centre. The validation phase of the study was supported by a grant from the UK Medical Research Council. The randomised phase was supported by grants from the Welsh Office of Research and Development, National Cancer Research Network, GE Healthcare, Wales Cancer Trials Network and Cancer Research UK funds (L. Fallowfield). Steering committee: Robert Haward (Chairman, Cookridge Hospital, Leeds), David Cohen (University of Glamorgan, Treforest), Ian Ellis (Nottingham City Hospital, Nottingham), Emiel Rutgers (Netherlands Cancer Institute, Amsterdam), Robert Mansel-Principal Investigator (Cardiff University, Cardiff), Lesley Fallowfield (Cancer Research UK Psychosocial Oncology Group, Brighton); Ciaran Woodman (Christie Hospital, Manchester), Robert Newcombe (Cardiff University, Cardiff), Peter J Ell (The Middlesex Hospital, London). Data monitoring committee: Mahesh Parmar (Chairman, Medical Research Council, London), John Northover (St Mark’s Hospital, London), John Yarnold (The Royal Marsden, London). Trial coordinator: Julia Townson (Cardiff University, Cardiff). Quality of Life: Karen Poole, Sam Coster, Rosemary Murray, Valerie Jenkins, (Cancer Research UK Psychosocial Oncology Group, Brighton). Participating centres and investigators: Bangor, Gwynedd Hospitals NHS Trust-Derek Crawford. Birmingham, Queen Elizabeth Medical Centre-David England. Cardiff, Cardiff University-Robert Mansel, Ian Monypenny, Helen Sweetland, David Webster. Derby, Derby City General Hospital-Mark Sibbering, Howard Holliday. Edinburgh, Western General Hospital-Utheshtra Chetty, J. Michael Dixon. Guildford, Royal Surrey County Hospital-Mark Kissin. Huddersfield, The Royal Infirmary-Richard Sainsbury. Hull, Castle Hill Hospital-Tapan Mahapatra. Leeds, Leeds General Infirmary-Kieran Horgan. London, Charing Cross Hospital-Dudley H. Sinnett. Manchester, South Manchester University Hospital-Lester Barr, Nigel Bundred. Nottingham, Nottingham City Hospital-James Geraghty. Portsmouth, Queen Alexandra Hospital-Constantinos Yiangou. Rhyl, Glan Clwyd Hospital-Christopher Davies. Swansea, Morriston Hospital-Mike Chare. Peterborough, Edith Cavell Hospital-Tholkifl Abdullah.